I can't even begin to count the amount of scraps of paper, torn out pages of magazines and recipe books I have in the dining room, all waiting to be loved and used and recipes wanting to be made. 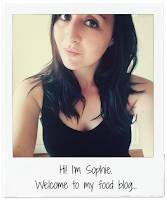 So, you can imagine my excitement when Farmersgirl Kitchen put together a new Recipe Clippings challenge so all of us food bloggers could actually blog about the great recipes we had found in magazines! It was tough to decide which to do first, but as I had some leftover bacon to use up I knew it had to be these Brummie Bacon Cakes which I had ripped out of a BBC Good Food Magazine, mainly intrigued as I live in Birmingham now and haven't heard of these before. I did try and research how and where they originated from but couldn't find out much. However, I can confirm they are basically just bacon and cheese scones. Perfectly nice though, serving suggestion in the magazine was with baked eggs (yum) but as Chris isn't an egg fan we had ours with some butter when they were warm straight out the oven, and a pot of tea. They'd also make a nice accompaniment to soup. 5. In a jug mix together the milk, ketchup and worcestershire sauce and then add to the bowl whilst stirring and bringing everything together as a dough. 6. On a lightly floured surface tip out the dough and knead slightly to bring it all together. Shape into an 18cm round and then brush with a little milk. 7. Cut the round into 8 wedges and put on the baking tray, sprinkle with the leftover cheese and bake in the oven for 25-30 minutes. How fantastic! 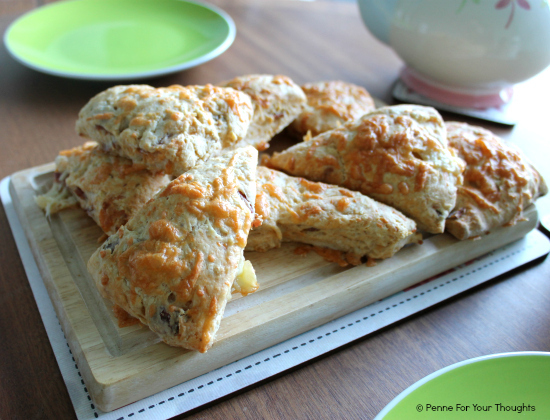 I love scones and have made bacon and cheese ones before, but I really like the addition of the tomato sauce and worcestershire sauce. Thanks so much for joining me for #RecipeClippings. Thanks for hosting it, can't wait to link up more! Ahh, what a cool idea, i hadn't heard of this before... glad I'm not alone in my compulsive need to collect recipe ideas. 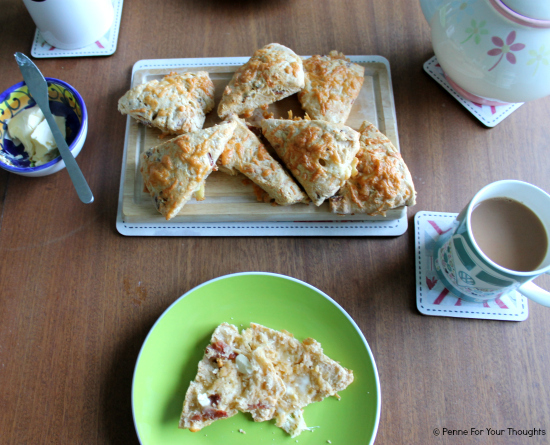 I love savory bakes like this, never heard of it before either but the idea of bacon and cheese in a scone - yes please!